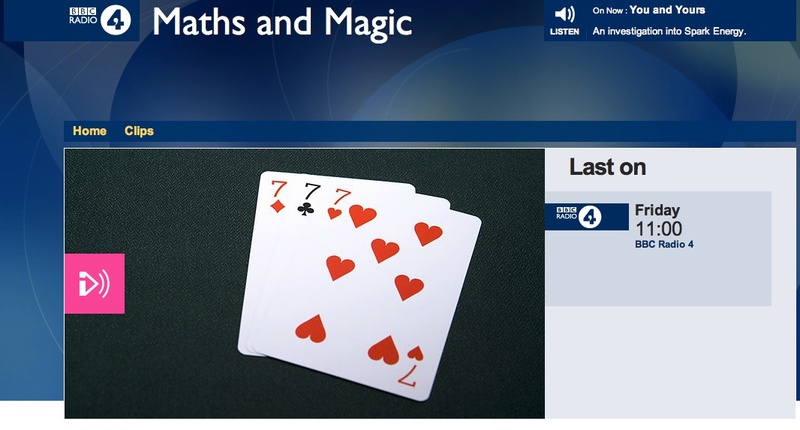 Should have posted this the other day: Last Friday Radio 4 transmitted a programme on maths and magic entitled, Maths and Magic! It features Jolyon Jenkins investigating the connection between the subjects in the title. You can hear it here for at least a few days. There are links on the web page but I thought I should add some. One of the magicians, Alex Stone, wrote one of my favourite books of the year, Fooling Houdini , which is about how he realized he was a terrible magician and devoted himself to changing that by immersing himself in the study of magic. He also does the same trick as Jenkins and there is a deeper explanation of it in the book. The Radio 4 website also lacks links to MathsJam and to James Grime, a contributor to Numberphile. Furthermore, the website cites Persi Diaconis as the sole author of Magical Mathematics when in fact it was co-authored by Ron Graham. And on the subject of Radio 4, today’s Infinite Monkey Cage isn’t about maths but is well worth a listen because of the excellent contributions from James Burke.